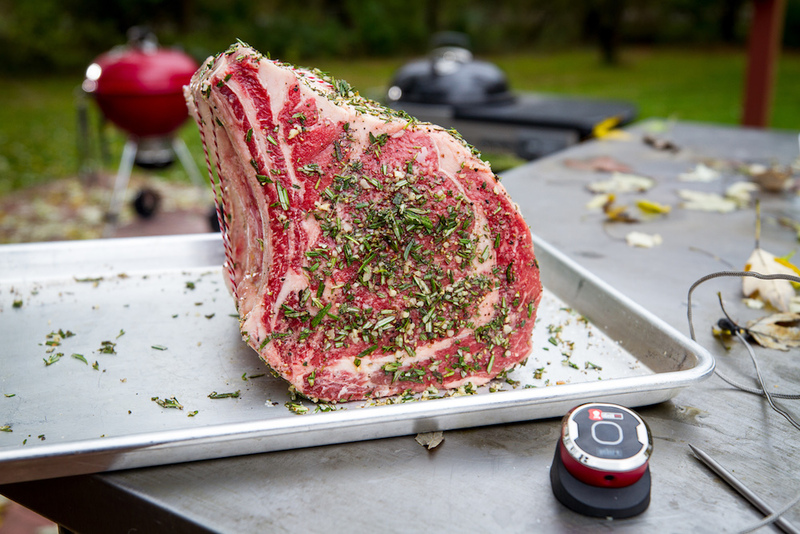 The holidays call for something extra special so I like to serve a bone-in prime rib to my family and friends. Don’t be intimidated by this cut of meat. It’s so easy and delicious – all it needs is a little salt and pepper, some fresh herbs, indirect heat and love. If you love the red kettle, it makes for a great holiday gift! 1. In a small bowl, mix first 4 ingredients together until a thin paste forms. Coat the roast evenly on all sides with the paste. Season the roast generously with salt and pepper. Allow the roast to stand at room temperature for 30 to 45 minutes before grilling. 2. Prepare the grill for indirect cooking over medium heat (about 400 degrees). 3. Brush the cooking grates clean. Drain and add the wood chips on top of the charcoal and close the lid. When the wood begins to smoke, place the roast on the grill, bone side down, over indirect medium heat. Cook with the lid closed as much as possible, until the internal temperature reaches 120 to 125 degrees for medium-rare, about 1 ½ hours. 4. Remove the roast from the grill, cover loosely with foil, and let rest about 20 minutes. Cut the roast into thick slices and serve immediately.